Can you sum up a massive (672 pages) book in 28 pages? Professor John Barclay demonstrates in this fine Grove Biblical booklet that the answer is ‘Yes’. I had the privilege of being in a reading group which worked through Barclay’s big book, Paul and the Gift (Grand Rapids: Eerdmans, 2015) in the earlier part of this year, and I am hugely impressed that he has such a good grasp of his own argument that he can express it both clearly and succinctly—an ability that many academics would do well to imitate. The booklet is divided into five short chapters. The first opens up the issue by observing that ‘gift’ and ‘grace’ are used in relation to God and humanity differently by different people: sometimes the focus is on the abundance of God’s grace (God gives with huge generosity); sometimes on the singularity of God’s grace (this is what God gives and nothing else); sometimes on the priority of God’s grace (that God gives prior to human response); sometimes on the incongruity of God’s grace (that God gives to the undeserving); sometimes on the efficacy of God’s grace (that it empowers and transforms people); and sometimes on the non-circularity of God’s grace (that it given without expecting or requiring a return). This analysis is key to everything which follows, for Barclay then goes on to identify that disputes among people about God’s grace are frequently the result of the disputants holding different emphases regarding what grace actually means. The subversiveness of grace in Paul’s understanding is that it undermines the way Paul’s world operated: the norm was that a gift put the recipient under obligation to return a gift to the giver. Indeed, as Barclay shows at greater length in the big book, the notion of a gift as something which by its very nature is not expecting a return is a relatively modern innovation. So, chapter two asks, where does Paul’s distinctiveness lie. Here, Barclay quickly and helpfully sketches the old and new perspective on Paul debates, before turning to outline some key Jewish views of grace from Paul’s time. These Jewish views are varied, and contradict both old and new perspective views. The old perspective view tended to assume that Jewish writers did not speak of God’s grace (whereas they did) and thus that Paul was introducing a new idea when he spoke of grace (it was not new). The new perspective view claimed that Jewish writers did speak of God’s grace and that Paul used the term in a similar way (and was not saying anything new). Rather, Barclay argues, although grace was everywhere present in Jewish thinking (against old perspective thinking), it was not everywhere the same (against new perspective thinking)—different Jewish authors placed the focus on different variants among the six view earlier. He sketches some good examples briefly (these cover several chapters in the big book), and an appendix provides some sample passages from the lesser-known Jewish writings. Paul’s distinctive, rather, is his focus on the incongruity, the undeservedness of God’s grace. Chapters three and four read Galatians and Romans (respectively) from this angle. Barclay argues that in Galatians Paul is opposing the view of some Jewish believers that it is necessary for believing Gentile men to be circumcised as necessary for salvation. In response, Paul highlights the undeserved nature of God’s grace in Christ, which means that it is no longer necessary to live like the Jews in order to be a member of the saved community. Rather, God’s grace relativises all human identities as irrelevant to human standing with God and with each other in the believing communities. In baptism, at the moment when believers put on Christ and enter the body of Christ, these previous hierarchies of worth are rendered insignificant (Gal 3.26-28; Col 2.9-11). (p 16). In Romans, Barclay notices that Paul subverts the normal ‘grammar’ of gift-giving, which is about ‘because’ and ‘therefore’—because X is my nephew, I give him a gift for his birthday; Y gained high marks in her exams, and therefore she gained a school prize. By contrast, Paul gives the Christ gift not only without people deserving this generosity, but in spite of the fact that they do not deserve it: ‘God demonstrates his love in this; while we were sinners, Christ died for us’ (Rom 5.8). Thus Romans 3.10-18 explicitly says that none can deserve God’s gift in Christ. Through the gift of Christ Israel is being reshaped as people follow Abraham and trust in God to save them through Christ. Nevertheless, Barclay draws a distinction between God’s gift being unconditioned—there is nothing in the recipient to deserve it—but not unconditional—there is an expectation of living a life of response to God (e.g. Rom 6.1-12; 12.1-2). Finally, chapter five addresses implications for the nature of Paul’s communities and for Christian communities today. In Paul’s churches, community is not defined by ethnicity, education, social standing or gender. Even slave believers and free believers first and foremost regard each other as sisters and brothers in Christ, rathe than as slave and free. In a final couple of paragraphs, Barclay points towards implications for the mission and life of today’s churches. There is a helpful bibliography of key sources, plus an appendix of quotations from some of the Jewish texts which will be less well known to many. This is a wonderfully helpful and clear explanation of the key discoveries John Barclay has made in re-reading Paul through the eyes of ancient and later understandings of gift and grace. It has huge implications for evangelism and Christian community today. It is excellent to have the argument expressed in such brief compass for those who will lack the time or opportunity to read the big book. 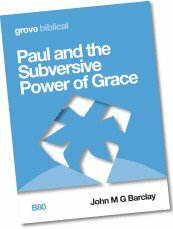 John M. G. Barclay, Paul and the Subversive Power of Grace (Grove Biblical series 80; Cambridge, Grove, 2016), ISBN 978 1 85174 975 1; £3.95 (paperback or digital format). Order from Grove Books.